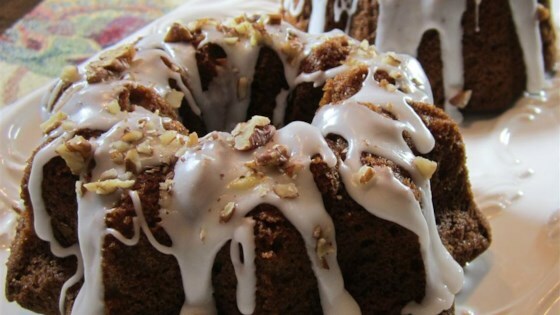 "Spicy cake that has everyone guessing what it is, and people eating it that do not like pumpkin and guessing with the others. Top with Cream Cheese Frosting if desired." In a large bowl, stir together cake mix, sugar, baking soda, cinnamon and ginger. Make a well in the center and pour in pumpkin puree, oil, and eggs. Beat on low speed until blended. Scrape bowl, and beat 4 minutes on medium speed. Stir in chopped pecans. Pour batter into prepared pan.